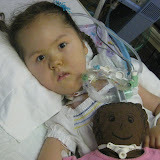 Here are some closeup photos of Ally with her trach and also some with her new glasses. I may use one of these for our MDA Brookfield Zoo Walk. Let me know which one you like best for the t-shirt and WHO WANTS TO JOIN THE ALLY’S ANGELS TEAM? The walk is Saturday, September 25th from about 8:30-10:30 am and zoo admission and parking is free if you raise funds and/or donate to the MDA in honor of Ally. PLEASE, please, please register online and let me know your t-shirt sizes for team and walk shirts. More details can be found at the below websites and/or past blogs. We do two walks each year and each donation brings us one step closer to a cure for SMA and offers families affected support and resources. Thanks in advance to those able to make a small donation and for those who have supported us in the past. It really means a ton to Ally and our family!!! For those wondering, Ally had a routine eye exam to rule out any problems and the optomotrist at Children’s Memorial discovered that she has astigmatism. If I understand right, her eyes are a different shape and she is very near sighted. 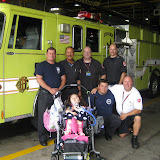 This has nothing to do with her SMA and we are glad we found it. Even things she sees close may be blurry. It will be interesting to see if she gets even better at using her computer with her eyes. Unfortunately we had to wait 11 1/2 weeks for our state insurance to make and pay for her glasses and when we picked them up this week, they are very tight on her. There is a limited selection to the ones we could select, but we thought we would at least try these ones out. The lightweight, comfortable ones with polycarbonate frames are about $300, but we may be exploring these or others very soon. We might also see if there are any organizations that might help pay for glasses since the better ones are not covered by insurance. Or, we will find a way after beginning of school expenses are paid. Ally looks adorable and she deserves the best! Thanks again for reading our blog! New pics – MDA Hawaiian Lua and more…. I will try to post something with more details soon, but wanted to see Who would like to join us for the MDA Stride & Ride at Brookfield Zoo on Saturday, September 25th from about 8am-10:30am? It is free admission and parking to the zoo for the entire day when you raise funds and/or donate to the MDA in honor of Ally! The goal is to raise $74 per person which funds 1 minute of research towards a cure and will get you a walk t-shirt. 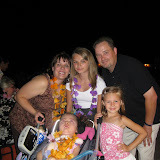 MDA funded most of the medical costs for the clinical trial Ally participated in for 2 years in CA, has paid for parts of her wheelchair, offers us tons of emotional support, pays for camp for children 6 years old and older (Ally gets to go soon)… and so much more. 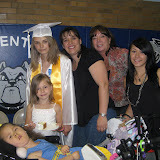 As you know, we do TWO walks each year, one for Families of SMA and this one for Muscular Dystrophy Association (MDA). We hope you will choose to join us for one of the walks or donate even a small amount (that will bring us one step closer to a treatment and cure). Please also email me with t-shirt sizes of yourself and anyone who will be joining us. We will be making Ally’s Angels team t-shirts again and need to also get business sponsors for the back (minimum donation of $150 or more). Let me know asap if you know any businesses interested and also if you will be joining us. This is our fourth year and we usually have about 50 or more team members. Hope you might be able to be with us this year. Friends and family are very important to us as we go through this journey! This will be a fun day and a great time to see each other. New PICTURES finally!!!! Things are GREAT at home! Things are going super, super well at home!!! 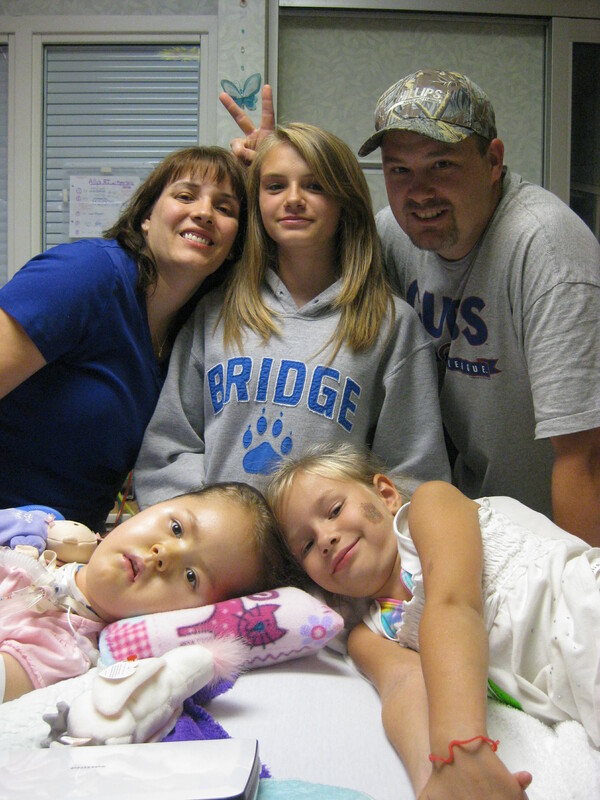 Ally and our family continue to adjust very well to this new phase in her life with a trach. It’s actually been super easy overall and such a wonderful decision we made. I hope to write a little more about it soon, but life has been VERY busy with lots of fun family time, organizing, and getting out. 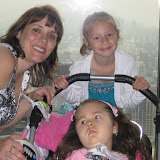 This is a very busy week with the MDA (Muscular Dystrophy Association) with visits to Fire Departments, Willis (Sears) Tower Luncheon, and Iron Workers Golf Outing this weekend…. Ally also got her casts off today. She had a tendon release while in the hospital since her ankles were super tight. This will allow her to more easily go in her stander for weight bearing and also allow her to be more comfortable in her afos and regular shoes.